The late 90s and early 2000s saw something of a boom in Mario spinoffs. 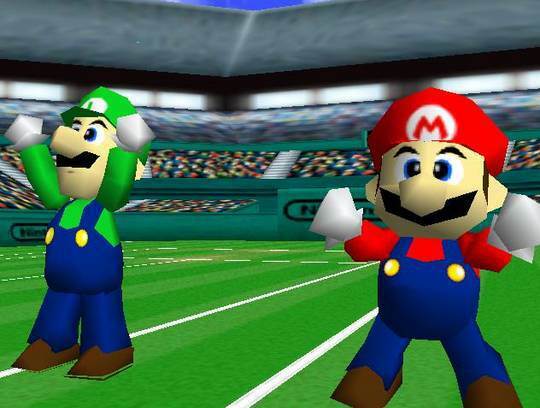 The capabilities of 3D gaming allowed for more immersive and realistic sports titles, and Nintendo capitalized on this during the N64 years, creating their own series of sports titles with a Mushroom Kingdom spin through developer Camelot. Most of these titles were successful enough to spawn sequels that continue to this day. Of this early lot of Mario sports games, the best was arguably Mario Tennis. Though it may feel a tad small when compared to more recent Mario sports titles, Mario Tennis remains a solidly fun game due to its core gameplay, which has aged gracefully. 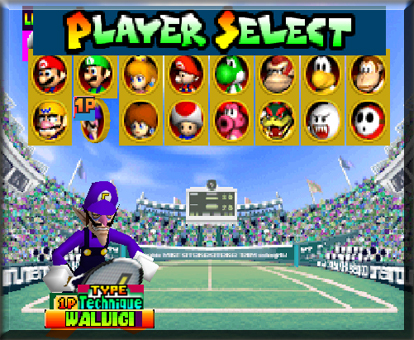 Before I divulge into the game itself, it should be noted that Mario Tennis holds the dubious honor of introducing Waluigi into the Mario series. This lanky, dastardly villain was created as the Luigi to Wario’s Mario. Unfortunately for Waluigi, being created for the sole purpose of giving Wario a tennis partner has prevented him of making much of an impact on the greater Mario series, and he’s been stuck as a filler character reserved solely for Mario spinoff titles ever since. But he’s a character so comically lame he’s become pitiable and, dare I say, even enjoyable (if ironically so). Mario Tennis’ character introduction may not be much to boast about, but it’s still a notable mark in Mario history. Though the game’s re-introduction of Daisy and Birdo into the franchise is less forgivable. Onto more important things. 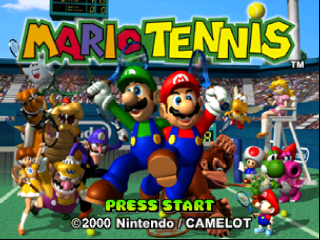 The gameplay of Mario Tennis features the ability to perform different shots by pressing one or both of two primary buttons (A and B in the original N64 release, but this is changeable in the Wii U Virtual Console version). Each button performs a different type of shot, and pressing the same button twice, or pressing the two buttons in different orders, can produce alternate, more powerful shots. It’s a simple setup that provides a surprising depth, as it gives the game a good sense of “easy to learn, difficult to master” that should make it appealing to players of various skill levels. Additional variety is added by the different characters, courts and modes. The character roster consists of many Mushroom Kingdom mainstays, who each take on different play styles (Mario and Luigi are well-rounded, Bowser and Donkey Kong are strong, the Princesses fall under the “technique” category, and so on). The differences in character abilities aren’t quite as prominent as they are in later Mario sports titles, and there aren’t any wacky special moves, but they all add a nice dose of versatility to the experience. The different courts lack the fun gimmicks that Mario sports games would later adopt, and feel more grounded in realism, with the differences in courts being based on how they effect the bounce of the ball as opposed to Mushroom Kingdom motifs (with the exceptions of some secret stages, though they too feel mundane when compared to later entries). Thankfully, the additional modes add some Mushroom Kingdom charm to the equation. Along with the standard exhibition and tournament modes (which provide both singles and doubles variants), there’s also Piranha Challenge, in which a group of Piranha Plants spit tennis balls at the player, who must then hit them past their opponent without missing too many of the Piranha Plants’ shots. Then there’s Ring Shot, a surprisingly addictive mode where you must hit the ball through a set number of rings, with your collective ring shots only counting if you score the point against your rival. Finally, there’s the simply-named Bowser Stage mode, where players face off on a shifting court that affects the players’ shots, while also giving players Mario Kart-like items to slow their opponents down. The game also has some pretty impressive AI. If you set the computer-controlled opponent on easy it’ll be a cakewalk, but if you up their difficulty you’ll be in for some tough tennis matches. Being a Nintendo 64 title, the graphics of course look dated and clumpy, but the colorful Mario aesthetics make it look more appealing than other titles in the genre of its time. The music is similarly more enjoyable than you might think out of a tennis game. Notably, the music in the game’s menus can be pretty soothing. The drawbacks to Mario Tennis include the aforementioned missed opportunities to fully capitalize of the Mario brand, as the game can sometimes feel more like a tennis game that happens to have Mario characters in it, as opposed to a full-fledged Mario tennis game. Some players may also long for more game modes, since the ones provided may not hold the interest of those more accustomed to the versatility of contemporary Mario sports titles. An additional downside to the Virtual Console release is that all the additional features provided by connecting the game to the Gameboy Color Mario Tennis title are absent, since the feature itself is no longer applicable. Without the transferring capabilities between the two games, Mario Tennis now feels like a good chunk of its content has been gutted. Still, even these drawbacks aren’t enough to deter the simple delight of the gameplay. For a sports game of any kind to hold up this well after fifteen years is impressive in of itself. The fact that it stars Mario and friends is just a huge bonus. And yes, that even includes Waluigi. Ironically enough, I think I ended up enjoying the Game Boy Color Mario Tennis more than the Nintendo 64 version. It’s not often you see a sports RPG; I think it’s an untapped market. If it’s one thing I’ve always liked about Camelot games, it’s the music. Motoi Sakuraba is an amazing composer and even the Camelot-made Mario sports games have great music. He also composed the score for Dark Souls, one of my favorite games of all time. The whole RPG/sports hybrid was very creative, and I don’t know why the console Mario sports games haven’t adopted that (especially since Mario and RPGs have proven they go together like peanut butter and jelly…provided that stickers aren’t involved). I admit I wasn’t aware Mario Tennis and Dark Souls shared a composer until I read your comment. That’s pretty cool! Dark Souls is a great series for sure, up there with the Mario Galaxy and Portal games as some of the best from the last console generation. Yep! They are the same person. He also composed the score to the Golden Sun games. I was surprised when I saw his name scroll by in the credits. I will definitely be picking up Ultra Smash. I think the tennis games are some of the best Mario sports titles, and Ultra Smash is looking really fun so far. Next Next post: Five Annoying Mario Maker Trends That Need to Stop!